Most of the materials I use for trim are antique and very limited in availability. Antique silk veiling, vintage ribbon, and other vintage trims are very expensive, hard to find, and impossible to re-order. If I find an antique trim I like, I buy everything the dealer has to secure exclusive use of it. Chances are, if you like an antique trim on one of my hats, you'll never see it anywhere else because of their extreme rarity. Sometimes I can only get enough of a trim to make one or two hats with, for others I have enough stock to make a greater number of hats, but either way, once I run out that's it. I have to discontinue the style. Looking at my inventory of materials, there is now only enough of my rare antique lace-border silk veiling in black to make about 13 or 14 more hats. I started out with a whole bolt of it, not a huge amount but very unusual to find for antique trim. But the 'Una' has been my most popular style and they sell as fast as I can make them. Once the lace veiling is gone I'll have to discontinue the 'Una' style. Had your eye on one? Better snap it up. 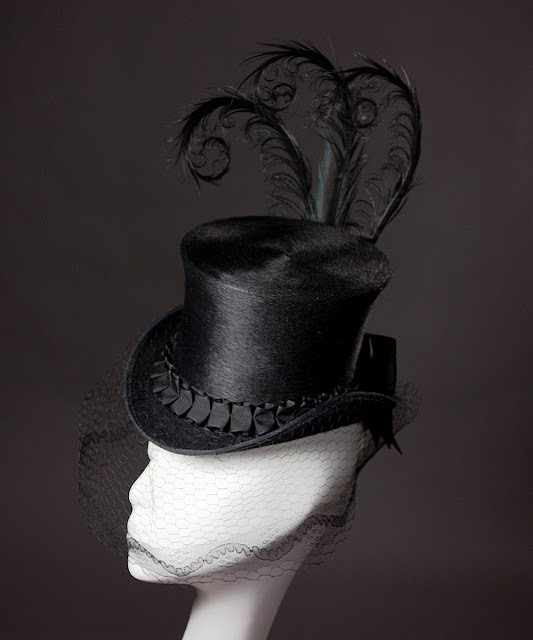 The 'Una' with black trim looks great in black felt, as well as in other contrast colors like red. 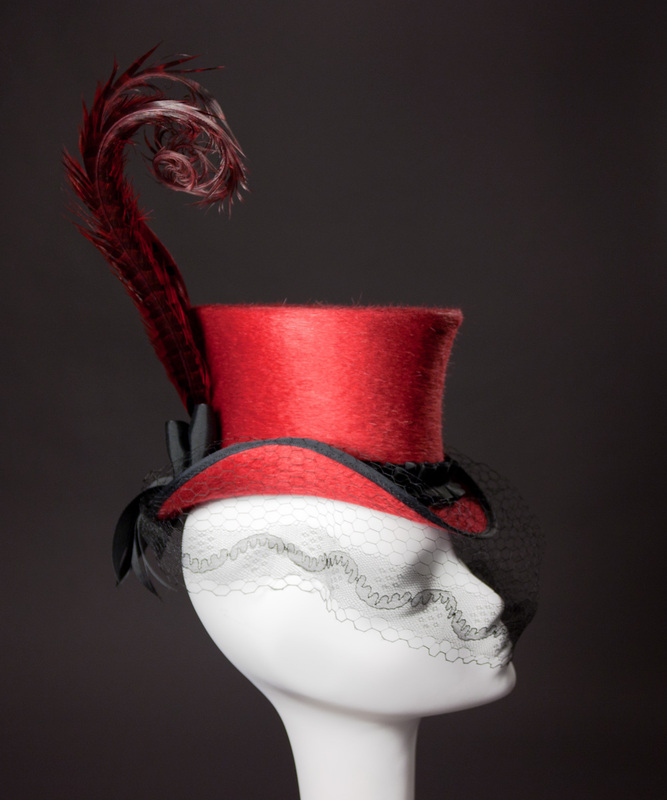 Both the black and red with black trim are available now in my Etsy shop. I've also always thought it would look great with silver gray felt, or another contrast color. Have an idea for alternate felt colors to go with black trim? Contact me to place a custom order. I also have a smaller amount of the same style of veiling in midnight blue (enough to make 8 hats), and chocolate brown (enough to make just 3 hats!). The blue would look great on a matching blue hat or silver gray felt. The brown would look fantastic on any shade of brown (camel, medium brown, or matching chocolate), or on a contrast color like pink. Have another idea for color combination? Contact me to discuss. I'll make up a sample of each to photograph for fall if I've still got enough to make them, but if you're interested in any of these veiling colors don't wait to ask, they won't last long.